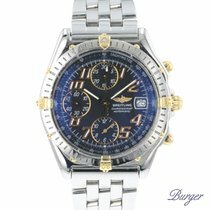 The Chronomat is one of Breitling's blockbuster hits. Its distinctive design and robust construction helped it to earn its cult status. Top models feature chronometer-certified in-house calibers with chronograph and GMT functions. The Breitling Chronomat has been writing a story of success for over 70 years. Breitling first introduced this watch in the early 1940s. Its name is a combination of the words "chronograph" and "mathematics." The Swiss manufacturer went on to use this watch as their basis for developing the world-famous Navitimer, which entered the market with an improved slide rule in 1952. In celebration of their 100th anniversary as a company in 1984, Breitling introduced a new version of the Chronomat. Its design has changed very little ever since. This chronograph is characterized by its onion-shaped crown and the bezel's four rider tabs at 3, 6, 9, and 12 o'clock. These riders make operating the bezel a breeze, even when wearing pilot's gloves. They also help to protect the sapphire glass from damage. The pilots of the Frecce Tricolori (Tricolor Arrows), the Italian Air Force's aerobatic demonstration team, selected the new Chronomat to serve as their official watch. Over the years, the watch has developed into one of Breitling's most successful models. Today, top Chronomat models feature a chronometer-certified in-house caliber with a 70-hour power reserve as well as chronograph and GMT functions. Models in 18-karat gold are also available, along with numerous diamond-studded editions. The 44-mm Chronomat 44 is water resistant to 500 m (50 bar, 1,640 ft) and is even suited for diving thanks to its unidirectional bezel. This includes the 2014 Chronomat 44 GMT Patrouille Suisse 50th Anniversary edition with chronograph and GMT functions, of which only 1,000 pieces were made. Breitling created this watch in honor of the official aerobatic demonstration team of the Swiss Air Force. You can buy one of these wristwatches for about 8,900 USD if you're lucky enough to find it. 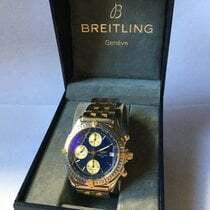 How much does a Breitling Chronomat cost? A Breitling Chronomat 41 with a 41-mm stainless steel case costs around 6,800 USD in mint condition. Pre-owned models are a bit less expensive at about 5,900 USD. In 2014, Breitling released the Chronomat 41 Airborne. Its design is more inspired by watches from the 1980s. 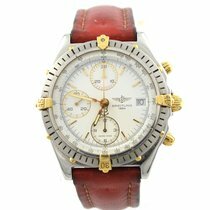 You can purchase this retro watch for 5,300 USD new and almost 4,900 USD pre-owned. Breitling outfitted both of these 41-mm wristwatches with their in-house caliber B01. If you prefer the 44-mm diameter and 500 m (50 bar, 1,640 ft) of water resistance of the Chronomat 44, you will need to set aside around 6,100 USD. You can get a pre-owned timepiece for about 1,500 USD less. There is also an Airborne version of this larger watch. It costs around 6,700 USD never-worn and almost 4,900 USD pre-owned. Prices for bicolor variants in gold and stainless steel start around 6,700 USD. However, models with diamonds on the bezel can cost over 12,200 USD. Chronomat models with 38-mm cases are geared more toward women. That being said, men with smaller wrists and those who want to keep up with the trend toward smaller watches can also sport this look. Models like the Chronomat 38 SleekT with a mother-of-pearl dial and diamond-studded bezel have a particularly feminine aesthetic. This piece of jewelry is listed at over 16,200 USD. If you can do without the diamonds and mother-of-pearl, you should take a closer look at the simple stainless steel models with polished bezels. In mint condition, these pieces go for as little as 5,600 USD. The Breitling Chronomat collection also contains a few black watches, including the Chronomat 44 Raven and the Blacksteel models. One highlight is the Chronomat GMT Blacksteel . It is powered by the in-house caliber B04, which provides it with chronograph and GMT functions. The 47-mm stainless steel case has a matte black satin-brushed finish while the indices and hour and minute hands are anthracite colored. The red stop seconds hand, tip of the GMT hand, and three small subdial hands add a splash of color to this otherwise monotone timepiece. Paired with a black rubber strap, this pilot's chronograph is at home on any stealth mission. Expect prices of around 7,900 USD. The Blacksteel is also available without a second time zone. The caliber B01 ticks away inside this chronograph-only version. Otherwise, its design is the same as the edition with GMT functionality. If you're looking for something a bit more colorful, you may enjoy the model with a yellow dial. The Chronomat 44 Blacksteel Special Edition is worn on a black rubber strap that is yellow on the wrist-facing side. Prices for never-worn examples sit around 8,100 USD. Yet another black watch in the Chronomat series is the Raven. Unlike the Blacksteel, the Raven tends to include colorful accents. The numerals on the bezel, the three subdial hands, the stopwatch seconds hand, and the rehaut are all in an eye-catching orange. The black winding rotor with orange inscriptions is another nice touch and can be viewed through the sapphire glass case back. Inside the Chronomat Raven, you will also find the caliber B01 at work. A black rubber strap makes sure this watch will stay on your wrist. You can buy a never-worn Raven for around 6,800 USD and a pre-owned model for almost 5,900 USD. How much do the Chronomat Evolution and Blackbird cost? The Breitling Chronomat Evolution carried on the tradition of success laid down by its predecessors until its production ceased in 2007. As of 2008, this series is simply called Chronomat. The majority of the Evolution models on the market today are pre-owned and cost around 3,700 USD. Never-worn models do exist, though they can cost up to 6,100 USD. The main feature of the younger Breitling Chronomat Blackbird is its outsize date display beneath the 12 o'clock position. Its name was inspired by the world's fastest manned aircraft, the Lockheed SR-71 Blackbird. This model underscores Breitling's connection to aeronautics. The caliber 44, based on the ETA 2892, ticks away inside this timepiece and has a 42-hour power reserve. A pre-owned Blackbird is relatively affordable at 2,600 USD. Examples in mint condition are harder to find and, therefore, demand prices of around 6,100 USD. The first Blackbird generation entered the market in the 1990s and lacked an outsize date. They also used the Breitling 13 caliber cased on the Valjoux 7750. These early Blackbirds have satin-brushed cases and matte dials. On the other hand, standard Chronomats have polished cases. With any luck, you may find a pre-owned Blackbird Chronograph for under 2,400 USD. Fans of vintage watches will find Chronomat watches with slide rule bezels particularly interesting. These include models like the reference number 808, which first appeared in the late 1950s. Prices for these timepieces fall between 2,900 and 7,900 USD. Models from the 1980s with the reference number 81950 would also complement any vintage watch collection. Breitling's caliber 13 powers these watches. Pieces with a so-called "Rouleaux" bracelet are especially authentic. These bracelets are constructed of cylindrical links. You can purchase a pre-owned Chronomat ref. 81950 for around 2,000 USD. The Breitling Chronomat 44 catches the eye with its case size of 44 mm. Like the Chronomat from 1984, the current 44 model also has four bezel rider tabs at 3, 6, 9, and 12 o'clock. Thanks to its sturdy case and screw-down crown, push-pieces, and case back, the chronograph is water resistant to 500 m (50 bar, 1,640 ft). The bezel is unidirectional and has a luminous marker at 12 o'clock. It fulfills all the requirements of a diving watch and can compete on the same level as famous diving watches such as the Rolex Submariner. The Rolex watch is water resistant to 300 m (30 bar, 984 ft) and lacks a chronograph function. The Breitling Chronomat 44 is available in many different versions: stainless steel, stainless steel with solid gold bezel rider tabs, solid 18-karat gold, and stainless steel with a gold bezel. There are also different dials available in black, blue, silver, or gray. Textile, leather, rubber, or metal bands are all available. Some models are worth more due to the presence of diamonds on the bezel and as indices. The domed sapphire glass features an anti-reflective coating on both sides. Newer models outfitted with the in-house caliber B01 feature a small seconds subdial at 9 o'clock, a 30-minute counter at 3 o'clock, and a 12-hour counter at 6 o'clock. The date display is located between 4 and 5 o'clock. Older models powered by the Valjoux 7750 display the date at 3 o'clock. On these models, the small seconds is located at 9, the 30-minute counter at 12, and the 12-hour counter at 6 o'clock. If the 44-mm Breitling Chronomat is too large for your taste, then the 41-mm version may be an option for you. The smaller model is available in stainless steel, solid gold, or stainless steel with a gold bezel. You can also find versions with diamond-studded bezels and diamonds as indices. Unlike its larger sibling, which is water resistant to 500 m (1,640 ft) the 41-mm version is only water resistant to a maximum of 300 m (984 ft). However, its dial and strap options are just as extensive as the Chronomat 44's. The Breitling Chronomat 38 is the model designed for women. With a smaller 38-mm diameter, it fits better on smaller wrists, although it's still on the larger side for a women's watch. Its smooth, glossy, tungsten carbide bezel emphasizes the overall feminine design. Tungsten carbide is also especially sturdy and scratch-resistant, making scratched-up bezels a thing of the past. This material is also used on the ridged bezel of Omega's Globemaster. The Chronomat 38 is only available in stainless steel with options of either a plain or diamond-studded bezel. 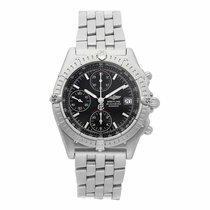 Breitling offers the dial in black as well as mother-of-pearl. The mother-of-pearl dial is available with or without diamond indices. Like the larger models, the Chronomat 38 has the option of a leather or rubber strap or a stainless steel bracelet. The Breitling 13 caliber ticks inside this watch. It's based on ETA's Valjoux 7750, one of the most successful automatic chronograph calibers in the world. Breitling's automatic caliber has a power reserve of 42 hours, 25 rubies, and can measure time in increments of one-eighth of a second. Breitling has had the caliber certified by the Official Swiss Chronometer Testing Institute, which guarantees its accuracy and precision. Breitling has been using their in-house caliber B01 in the Chronomat since 2009. Unlike the classic chronograph caliber Valjoux 7750, which has a power reserve of only 42 hours, the B01 has a power reserve of 70 hours. The movement's winding rotor ensures there's a continual supply of energy, making hand winding unnecessary. The balance wheel has a frequency of 28,800 A/h, which is equal to 4 Hz. This allows you to time periods to within one-eighth of a second. Like the Valjoux 7750, the B01 has a diameter of 30 mm. At 7.2 mm, however, it's 0.7 mm thinner than the 7750. The B01's dimensions make it easy to replace, which is one of the reasons Breitling uses it in many of their models.